"Take almost any yardstick and Bush generally exceeds the spending of his predecessors. When adjusted for inflation, discretionary spending — or budget items that Congress and the president can control, including defense and domestic programs, but not entitlements such as Social Security and Medicare — shot up at an average annual rate of 5.3 percent during Bush’s first six years, Slivinski calculates. That tops the 4.6 percent annual rate Johnson logged during his 1963-69 presidency. By these standards, Ronald Reagan was a tightwad; discretionary spending grew by only 1.9 percent a year on his watch ... Brian Riedl, a budget analyst at the Heritage Foundation, a conservative research group, points to education spending. Adjusted for inflation, it's up 18 percent annually since 2001, thanks largely to Bush’s No Child Left Behind act. The 2002 farm bill, he said, caused agriculture spending to double its 1990s levels. Then there was the 2003 Medicare prescription drug benefit — the biggest single expansion in the program’s history — whose 10-year costs are estimated at more than $700 billion. And the 2005 highway bill, which included thousands of “earmarks,” or special local projects stuck into the legislation by individual lawmakers without review, cost $295 billion. “He has presided over massive increases in almost every category … a dramatic change of pace from most previous presidents,” said Slivinski." The column got a lot of attention in the blogosphere and MSM, including the Washington Post, James Joyner at Outside The Beltway, Justin Gardner at Donklephant, Steven Reynolds at the All Spin Zone, 6SpeedTA95 at The Liberty Lounge, The Street.com, Gray Matter, Leisure Guy at Later On, Deraj at Volcanvo, Ed Morrissey at Captain's Quarters, Investor's Business Daily, Taylor Marsh, USA Today, Houston Chronicle, MVDG Gazette, and many more. "Further to Dan’s post below, here’s the McClatchy story arguing that President Bush is the biggest spending president since LBJ. The article got lots of notice — probably because it was linked on the Drudge Report for most of Wednesday. The story is mostly old news — I’ve been making the same point for years. But, because it is based on updated data that I provided to the reporter, I’m happy to see the message ripple through the news cycle." 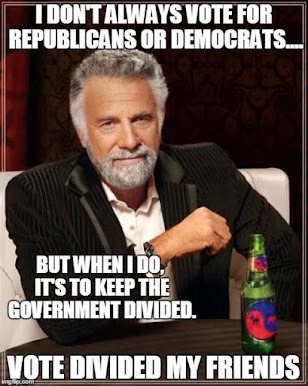 "...government grows slower when at least one house of Congress is controlled by a political party different than the president's—a condition known to political scientists as "divided government," or popularly known as "gridlock. Since 1965, government has grown slower in periods of divided government than in periods of united government. On average, united government tends to lead to a 3.4% annual increase in federal spending in real per capita terms—over double the growth under divided government: 1.5%. When you look at the data in terms of how fast government grew in relation to the economy, the results still favor divided government. The average yearly increase in government above and beyond GDP growth is 25 times faster when one party has a monopoly over both the legislative and executive branches than it does when gridlock is present. The one thing you can usually count on in Washington is partisanship. When Republicans are the beleaguered minority—or a congressional majority fighting a big-spending White House—they are in their element. Big Government is the clear enemy. But once they find themselves in control of it all, they don't rein each other in. Instead, they egg each other on. We can see this by comparing how a GOP Congress treated the proposed non-defense budgets of Bill Clinton and George W. Bush. During the years of divided government under Clinton, a sort of gridlock ensued. The Republican Congress managed to cut Clinton's domestic spending requests by an average of $9 billion each year between fiscal 1996 and 2001. Contrast that with the budget outcomes under President Bush—specifically the years in which Congress was held entirely by Republicans. Between fiscal years 2003 and 2006, Congress passed, and Bush refused to veto, non-defense budgets that were an average of $16 billion more than the president proposed each year." To my knowledge, William Niskanen, former chairman of President Reagan's Council of Economic Advisers, was the first to document this effect. Slivisnski's research has built on and amplified Niskanen's work. It is beyond dispute that the two biggest spending Presidents of the last 50+ years are GWB and LBJ. Depending on which metrics are used, one can quibble about who is the single biggest spending pig, but by any measure, they are the top two. LBJ led a unified Democratic government during his tenure. GWB led a unified Republican government for the first six years of his administration. During the time this administration also enjoyed majority control in the legislature, discretionary spending was increasing at over 7% per year, blowing away LBJ's record. Since GWB faced a divided government this year, the annual spending increase has dropped to a 3% rate. I am not going to try and explain the mechanism of why it works. It just does. Every time, without exception. If the objective of limiting the growth of federal spending is important to you, there is one sure way to get there - keep this government divided. Let's not kid ourselves. A single party Democratic government in 2009 will be every bit as bad as the single party Republican government of the last six years. The only difference will be which special interests and lobbyists will be the beneficiary of the increased spending of our tax dollars. 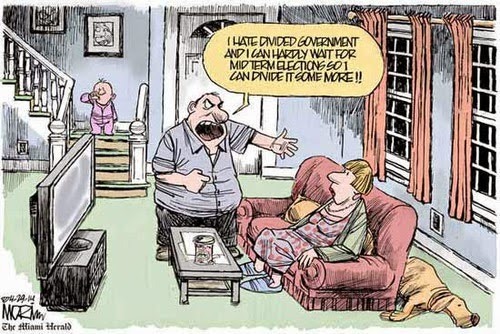 The logical vote in 2006 was to vote for a straight Democratic ticket to divide our government. The logical vote to avoid LBJ Redux in 2009 is to vote for a Republican president in 2008 to keep it divided. Technorati tags: Divided Government, Republican, George Bush, LBJ, Democrat.